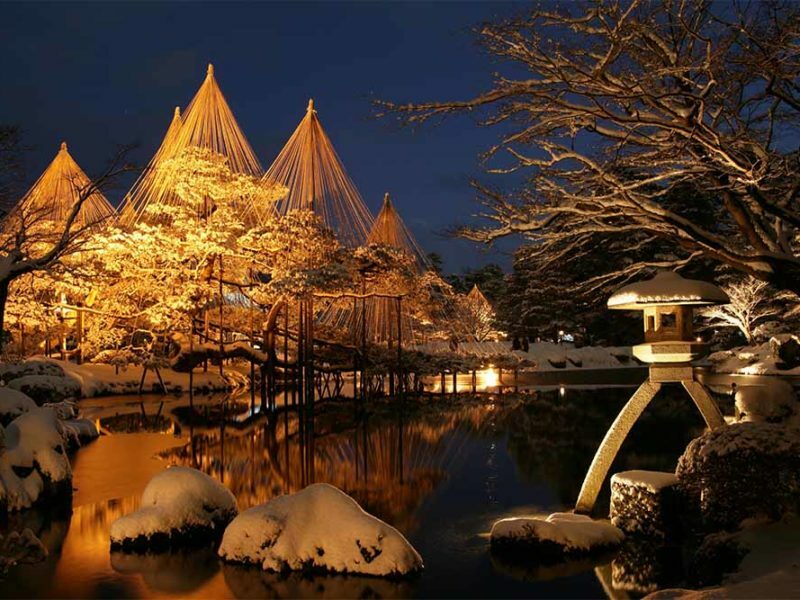 Between them, the cities of Kanazawa and Nagano offer Japan’s ultimate winter wonderland – all within easy reach of Tokyo. With its intoxicating blend of ancient and modern; of stunning natural beauty and awe-inspiring man-made monuments; and experiences ranging from the exhilarating to the serenely sublime, Japan offers travellers the perfect ‘choose your own adventure’ kind of holiday. The only challenge? Figuring out how to make the most of your time in this inimitable country. One of the Japanese railway system’s newest routes, the Hokuriku Arch Pass provides seven consecutive days of travel between Tokyo and Osaka, taking in the cities of both Nagano and Kanazawa (plus other must-sees, such as Kyoto). The ride from Tokyo to Nagano is approximately an hour and a half; from here, it’s an hour’s bus ride to the Togakushi ski area, where you’ll find a powder-coated three-kilometre run and 18 other courses to tackle, along with breathtaking views of the majestic Togakushi Mountain Range. Those less adrenalin-inclined can soak up the scenery whilst snow-shoeing, or be mesmerised by the mirror-like views dancing on the surface of Lake Kagami-ike. For a good night’s sleep, Togakushi offers a novel way to bed down: by checking into a shukubo. These simple lodgings – found within or near temple complexes – used to serve as a resting place for pilgrims, and now provide guests an insight into this unique aspect of Japanese culture. The shukubo serve an array of shojin ryori (Buddhist vegetarian cuisine), rounding out a nourishing experience for both body and soul. Nagano’s Zenkoji Temple is a sight to behold early in the morning, when the first, soft sunlight illuminates the beautiful complex during the sunrise service. This National Treasure dates back 1400 years, and continues to attract pilgrims today; lose yourself among its gates, shrines and museum, soaking up the sacred atmosphere. For an insight into Nagano’s samurai past, take a 30-minute bus ride to Matsushiro, a gorgeous historical town centred on the remains of Matsushiro castle and its surrounding former samurai residences and temples. Enveloped by nearby mountains and a moat, the architecture here forms a perfect complement to the seasons, with clouds of cherry blossoms come spring and dustings of snow in winter. Take it all in from a contemplative perch in the sanada-tei (a former residence of the ruling Sanada samurai family). Finish your day by returning to your quiet shukubo, or take the shinkansen to your next destination, Kanazawa, a little over an hour away. Kanazawa station’s Motenashi (‘welcome’) Dome – a striking contemporary masterpiece of glass and metal – is a futuristic counterpoint to the impressive Tsuzumi-mon Gate outside. It’s a fitting juxtaposition for this fascinating city, which has grown from (and preserved) its 16th-century origins as a castle town to also become a site of modern Japanese culture (don’t miss the 21st Century Museum of Contemporary Art). Get back to nature at Kenrokuen Garden, beautifully nurtured through the centuries since the ruling Maeda family first established the city. 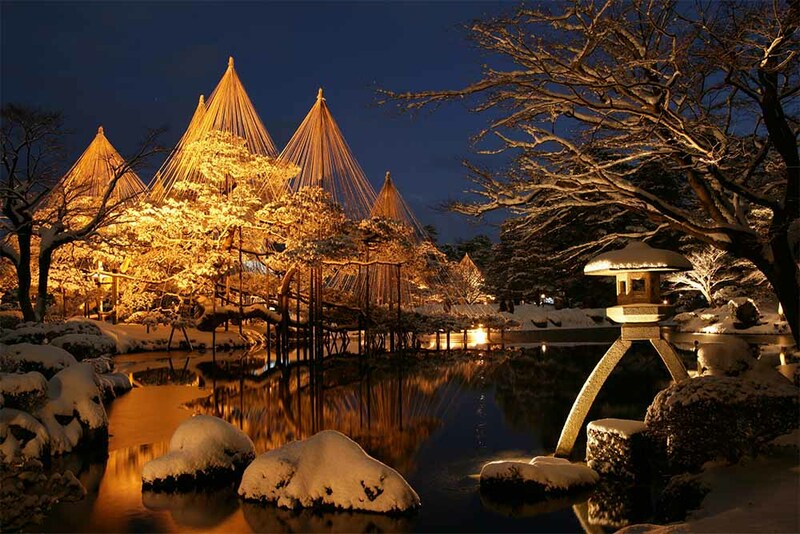 Each season brings its own unique beauty to its vista of ponds, hills and houses, especially in winter, when the yukitsuri (conical arrangements of ropes protecting tree branches from heavy snow) appear. One of the strongest echoes of Kanazawa’s past can be found in its three Chaya districts – Higashi, Nishi and Kazue-machi – where lovely, lattice-windowed wooden geisha houses still stand, and geisha culture lives on. While most traditional geisha houses refuse entry to newcomers without an introduction, a wonderful evening can be had strolling the atmospherically lit streets and sampling the sake bars; casual geisha performances are also held. Or visit Kaikaro in Higashi Chaya District – Kanazawa’s largest teahouse – where special Geisha Evenings every spring and autumn (check website for dates) showcase live music and geisha performances. The ancient Maeda clan encouraged the practice of tea ceremonies, leading to Kanazawa’s reputation as a ‘sweet spot’, thanks to the elaborate confectioneries that accompanied them. Indulge your sweet tooth with these petite works of edible art – perfect with tea (or for your next shinkansen ride). Overlooking the Sea of Japan, Kanazawa is bursting with fresh seafood, particularly in winter – try some exquisite snow crab or yellowtail sushi, or Kaisen-don (rice bowl topped with sashimi) for lunch. Looking for something more formal? Kanazawa’s rich natural bounty has bred a distinguished ‘Kaga cuisine’, with local produce presented beautifully in serene settings, often overlooking a Japanese garden; try jibuni, duck coated in flour then boiled and served with vegetables in a hearty broth. Sated and exhilarated, it’s time to board the shinkansen for your next stop. Tokyo – Nagano: approx. 1 hour 30 minutes. Nagano – Kanazawa: approx. 1 hour. Kanazawa – Kyoto: approx. 2 hours. Check Hokuriku Arch Pass Visit hokuriku-arch-pass.com/en to get a pass for unlimited travel.